Orthogenesis, also known as orthogenetic evolution, progressive evolution, evolutionary progress, or progressionism, is the biological hypothesis that organisms have an innate tendency to evolve in a definite direction towards some goal (teleology) due to some internal mechanism or "driving force". According to the theory, the largest-scale trends in evolution have an absolute goal such as increasing biological complexity. Prominent historical figures who have championed some form of evolutionary progress include Jean-Baptiste Lamarck, Pierre Teilhard de Chardin, and Henri Bergson. The term orthogenesis was introduced by Wilhelm Haacke in 1893 and popularized by Theodor Eimer five years later. Proponents of orthogenesis had rejected the theory of natural selection as the organizing mechanism in evolution for a rectilinear model of directed evolution. With the emergence of the modern synthesis, in which genetics was integrated with evolution, orthogenesis and other alternatives to Darwinism were largely abandoned by biologists, but the notion that evolution represents progress is still widely shared. The evolutionary biologist Ernst Mayr made the term effectively taboo in the journal Nature in 1948, by stating that it implied "some supernatural force". The American paleontologist George Gaylord Simpson (1953) attacked orthogenesis, linking it with vitalism by describing it as "the mysterious inner force". Modern supporters include E. O. Wilson and Simon Conway Morris, while museum displays and textbook illustrations continue to give the impression of progress in evolution. The philosopher of biology Michael Ruse notes that in popular culture evolution and progress are synonyms, while the unintentionally misleading image of the March of Progress, from apes to modern humans, has been widely imitated. The term orthogenesis (from Ancient Greek ὀρθός orthós, "straight", and γένεσις génesis, "origin") was first used by the biologist Wilhelm Haacke in 1893. Theodor Eimer was the first to give the word a definition; he defined orthogenesis as "the general law according to which evolutionary development takes place in a noticeable direction, above all in specialized groups". [Orthogenesis] has meant many different things to many different people, ranging from a mystical inner perfecting principle, to merely a general trend in development due to the natural constitutional restrictions of the germinal materials, or to the physical limitations imposed by a narrow environment. In most modern statements of the theory, the idea of continuous and progressive change in one or more characters, due according to some to internal factors, according to others to external causes-evolution in a "straight line" seems to be the central idea. Orthogenesis meant literally "straight origins", or "straight line evolution". The term varied in meaning from the overtly vitalistic and theological to the mechanical. It ranged from theories of mystical forces to mere descriptions of a general trend in development due to natural limitations of either the germinal material or the environment ... By 1910, however most who subscribed to orthogenesis hypothesized some physical rather than metaphysical determinant of orderly change. In 1988, Francisco J. Ayala defined progress as "systematic change in a feature belonging to all the members of a sequence in such a way that posterior members of the sequence exhibit an improvement of that feature". He argued that there are two elements in this definition, directional change and improvement according to some standard. Whether a directional change constitutes an improvement is not a scientific question; therefore Ayala suggested that science should focus on the question of whether there is directional change, without regard to whether the change is "improvement". This may be compared to Stephen Jay Gould's suggestion of "replacing the idea of progress with an operational notion of directionality". Literally, the term means evolution in a straight line, generally assumed to be evolution that is held to a regular course by forces internal to the organism. Orthogenesis assumes that variation is not random but is directed towards fixed goals. Selection is thus powerless, and the species is carried automatically in the direction marked out by internal factors controlling variation. In 1996, Michael Ruse defined orthogenesis as "the view that evolution has a kind of momentum of its own that carries organisms along certain tracks". The possibility of progress is embedded in the mediaeval great chain of being, with a linear sequence of forms from lowest to highest. The concept, indeed, had its roots in Aristotle's biology, from insects that produced only a grub, to fish that laid eggs, and on up to animals with blood and live birth. The mediaeval chain, as in Ramon Lull's Ladder of Ascent and Descent of the Mind, 1305, added steps or levels above humans, with orders of angels reaching up to God at the top. The orthogenesis hypothesis had a significant following in the 19th century when evolutionary mechanisms such as Lamarckism were being proposed. The French zoologist Jean-Baptiste Lamarck (1744–1829) himself accepted the idea, and it had a central role in his theory of inheritance of acquired characteristics, the hypothesized mechanism of which resembled the "mysterious inner force" of orthogenesis. Orthogenesis was particularly accepted by paleontologists who saw in their fossils a directional change, and in invertebrate paleontology thought there was a gradual and constant directional change. Those who accepted orthogenesis in this way, however, did not necessarily accept that the mechanism that drove orthogenesis was teleological (had a definite goal). Charles Darwin himself rarely used the term "evolution" now so commonly used to describe his theory, because the term was strongly associated with orthogenesis, as had been common usage since at least 1647. Reviewing Darwin's Origin of Species, Karl Ernst von Baer argued for a directed force guiding evolution. Henry Fairfield Osborn's 1934 version of orthogenesis, aristogenesis, argued that aristogenes, not mutation or natural selection, created all novelty. Osborn supposed that the horns of Titanotheres evolved into a baroque form, way beyond the adaptive optimum. In 1898, after studying butterfly coloration, Theodor Eimer (1843–1898) introduced the term orthogenesis with a widely read book, On Orthogenesis: And the Impotence of Natural Selection in Species Formation. Eimer claimed there were trends in evolution with no adaptive significance that would be difficult to explain by natural selection. To supporters of orthogenesis, in some cases species could be led by such trends to extinction. Eimer linked orthogenesis to neo-Lamarckism in his 1890 book Organic Evolution as the Result of the Inheritance of Acquired Characteristics According to the Laws of Organic Growth. He used examples such as the evolution of the horse to argue that evolution had proceeded in a regular single direction that was difficult to explain by random variation. Gould described Eimer as a materialist who rejected any vitalist or teleological approach to orthogenesis, arguing that Eimer's criticism of natural selection was common amongst many evolutionists of his generation; they were searching for alternative mechanisms, as they had come to believe that natural selection could not create new species. Numerous versions of orthogenesis (see table) have been proposed. Debate centred on whether such theories were scientific, or whether orthogenesis was inherently vitalistic or essentially theological. For example, biologists such as Maynard M. Metcalf (1914), John Merle Coulter (1915), David Starr Jordan (1920) and Charles B. Lipman (1922) claimed evidence for orthogenesis in bacteria, fish populations and plants. In 1950, the German paleontologist Otto Schindewolf argued that variation tends to move in a predetermined direction. He believed this was purely mechanistic, denying any kind of vitalism, but that evolution occurs due to a periodic cycle of evolutionary processes dictated by factors internal to the organism. In 1964 George Gaylord Simpson argued that orthogenetic theories such as those promulgated by Du Noüy and Sinnott were essentially theology rather than biology. Though evolution is not progressive, it does sometimes proceed in a linear way, reinforcing characteristics in certain lineages, but such examples are entirely consistent with the modern neo-Darwinian theory of evolution. These examples have sometimes been referred to as orthoselection but are not strictly orthogenetic, and simply appear as linear and constant changes because of environmental and molecular constraints on the direction of change. The term orthoselection was first used by Ludwig Hermann Plate, and was incorporated into the modern synthesis by Julian Huxley and Bernard Rensch. Recent work has supported the mechanism and existence of mutation-biased adaptation, meaning that limited local orthogenesis is now seen as possible. For the columns for other philosophies of evolution (i.e., combined theories including any of Lamarckism, Mutationism, Natural selection, and Vitalism), "yes" means that person definitely supports the theory; "no" means explicit opposition to the theory; a blank means the matter is apparently not discussed, not part of the theory. Baer Purposeful creation Embryology 1859 "Forces which are not directed—so-called blind forces—can never produce order." Nägeli Inner perfecting principle Botany 1884 yes no An "idioplasm" transmitted inherited characteristics; many evolutionary developments nonadaptive; variation internally programmed. Darwin (concept of higher and lower species), Pangenesis Evolution 1859 yes yes Origin of Species is somewhat progressionist, e.g. man higher than animals, alongside natural selection Pangenesis theory of inheritance by gemmules from all over body was Lamarckian: parents could pass on traits acquired in lifetime. Eimer Orthogenesis Zoology 1898 no On Orthogenesis: And the Impotence of Natural Selection in Species Formation: trends in evolution with no adaptive significance, claimed hard to explain by natural selection. Schindewolf Typostrophism Palaeontology 1950 yes Basic Questions in Paleontology: Geologic Time, Organic Evolution and Biological Systematics; evolution due to periodic cycle of processes dictated by factors internal to organism. Mysticism 1959 yes The Phenomenon of Man posthumous; combined orthogenesis with non-material vitalist directive force aiming for a supposed "Omega Point" with creation of consciousness. Noosphere concept from Vladimir Vernadsky. Censured by Gaylord Simpson for nonscientific spiritualistic "doubletalk". Lima-de-Faria Autoevolutionism Physics, Chemistry 1988 No No No No? Natural selection is immaterial so cannot work. Multiple explanations have been offered since the 19th century for how evolution took place, given that many scientists initially had objections to natural selection. Many of these theories led (solid blue arrows) to some form of orthogenesis, with or without invoking divine control (dotted blue arrows) directly or indirectly. 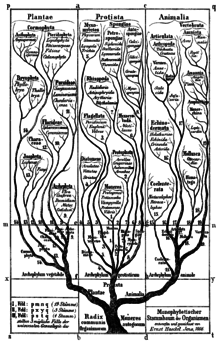 For example, evolutionists like Edward Drinker Cope believed in a combination of theistic evolution, Lamarckism, vitalism, and orthogenesis, represented by a sequence of arrows on the left of the diagram. The development of modern Darwinism is indicated by dashed orange arrows. At theoretical and philosophical levels, Lamarckism and orthogenesis seemed to solve too many problems to be dismissed out of hand—yet biologists could never reliably document them happening in nature or in the laboratory. Support for both concepts evaporated rapidly once a plausible alternative appeared on the scene. The modern synthesis of the 1930s and 1940s, in which the genetic mechanisms of evolution were incorporated, appeared to refute the hypothesis for good. As more was understood about these mechanisms it came to be held that there was no naturalistic way in which the newly discovered mechanism of heredity could be far-sighted or have a memory of past trends. Orthogenesis was seen to lie outside the methodological naturalism of the sciences. Ernst Mayr considered orthogenesis effectively taboo in 1948. 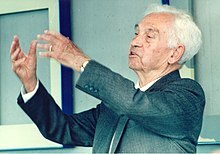 By 1948, the evolutionary biologist Ernst Mayr, as editor of the journal Evolution, made the use of the term orthogenesis taboo: "It might be well to abstain from use of the word 'orthogenesis' .. since so many of the geneticists seem to be of the opinion that the use of the term implies some supernatural force." With the rise of evolutionary developmental biology in the late 20th-early 21st centuries, however, which is open to an expanded concept of heredity that incorporates the physics of self-organization, ideas of constraint and preferred directions of morphological change have made a reappearance in evolutionary theory. For these and other reasons, belief in evolutionary progress has remained "a persistent heresy", among evolutionary biologists including E. O. Wilson and Simon Conway Morris, although often denied or veiled. The philosopher of biology Michael Ruse wrote that "some of the most significant of today's evolutionists are progressionists, and that because of this we find (absolute) progressionism alive and well in their work." He argued that progressionism has harmed the status of evolutionary biology as a mature, professional science. Presentations of evolution remain characteristically progressionist, with humans at the top of the "Tower of Time" in the Smithsonian Institution in Washington D.C., while Scientific American magazine could illustrate the history of life leading progressively from mammals to dinosaurs to primates and finally man. Ruse noted that at the popular level, progress and evolution are simply synonyms, as they were in the nineteenth century, though confidence in the value of cultural and technological progress has declined. The frontispiece to Thomas Henry Huxley's 1863 Evidence as to Man's Place in Nature was intended to compare the skeletons of apes and humans, but unintentionally created a durable meme of supposed "monkey-to-man" progress. In popular culture, progressionist images of evolution are widespread. The historian Jennifer Tucker, writing in The Boston Globe, notes that Thomas Henry Huxley's 1863 illustration comparing the skeletons of apes and humans "has become an iconic and instantly recognizable visual shorthand for evolution." She calls its history extraordinary, saying that it is "one of the most intriguing, and most misleading, drawings in the modern history of science." Nobody, Tucker observes, supposes that the "monkey-to-man" sequence accurately depicts Darwinian evolution. The Origin of Species had only one illustration, a diagrams showing that random events create a process of branching evolution, a view that Tucker notes is broadly acceptable to modern biologists. But Huxley's image recalled the great chain of being, implying with the force of a visual image a "logical, evenly paced progression" leading up to Homo sapiens, a view denounced by Stephen Jay Gould in Wonderful Life. Popular perception, however, had seized upon the idea of linear progress. Edward Linley Sambourne's Man is But a Worm, drawn for Punch's Almanack, mocked the idea of any evolutionary link between humans and animals, with a sequence from chaos to earthworm to apes, primitive men, a Victorian beau, and Darwin in a pose that according to Tucker recalls Michelangelo's figure of Adam in his fresco adorning the ceiling of the Sistine Chapel. This was followed by a flood of variations on the evolution-as-progress theme, including The New Yorker's 1925 "The Rise and Fall of Man", the sequence running from a chimpanzee to Neanderthal man, Socrates, and finally the lawyer William Jennings Bryan who argued for the anti-evolutionist prosecution in the Scopes Trial on the State of Tennessee law limiting the teaching of evolution. Tucker noted that Rudolph Franz Zallinger's 1965 "The Road to Homo Sapiens" fold-out illustration in F. Clark Howell's Early Man, showing a sequence of 14 walking figures ending with modern man, fitted the palaeoanthropological discoveries "not into a branching Darwinian scheme, but into the framework of the original Huxley diagram." Howell ruefully commented that the "powerful and emotional" graphic had overwhelmed his Darwinian text. Scientists, Ruse argues, continue to slide easily from one notion of progress to another: even committed Darwinians like Richard Dawkins embed the idea of cultural progress in a theory of cultural units, memes, that act much like genes. Dawkins can speak of "progressive rather than random ... trends in evolution". Dawkins and John Krebs deny the "earlier [Darwinian] prejudice" that there is anything "inherently progressive about evolution", but the feeling of progress comes from evolutionary arms races which remain in Dawkins's words "by far the most satisfactory explanation for the existence of the advanced and complex machinery that animals and plants possess". Ruse concludes his detailed analysis of the idea of Progress, meaning a progressionist philosophy, in evolutionary biology by stating that evolutionary thought came out of that philosophy. Before Darwin, Ruse argues, evolution was just a pseudoscience; Darwin made it respectable, but "only as popular science". "There it remained frozen, for nearly another hundred years", until mathematicians such as Fisher provided "both models and status", enabling evolutionary biologists to construct the modern synthesis of the 1930s and 1940s. That made biology a professional science, at the price of ejecting the notion of progress. That, Ruse argues, was a significant cost to "people [biologists] still firmly committed to Progress" as a philosophy. Biology has largely rejected the idea that evolution is guided in any way, but the evolution of some features is indeed facilitated by the genes of the developmental-genetic toolkit studied in evolutionary developmental biology. An example is the development of wing pattern in some species of Heliconius butterfly, which have independently evolved similar patterns. These butterflies are Müllerian mimics of each other, so natural selection is the driving force, but their wing patterns, which arose in separate evolutionary events, are controlled by the same genes. ^ a b c d Bowler 1989, pp. 268–270. ^ Mayr, Ernst (1988). Toward a New Philosophy of Biology: Observations of an Evolutionist. Harvard University Press. p. 499. ISBN 978-0-674-89666-6. ^ a b c d e Ruse 1996, pp. 526–539. ^ Ulett, Mark A. (2014). "Making the case for orthogenesis: The popularization of definitely directed evolution (1890–1926)". Studies in History and Philosophy of Biological and Biomedical Sciences. 45: 124–132. doi:10.1016/j.shpsc.2013.11.009. PMID 24368232. ^ a b c Ruse 1996, p. 447. ^ Simpson, George Gaylord (1953). Life of the Past: An Introduction to Paleontology. Yale University Press. p. 125. ^ a b c d e f g h i j k l m n Levit, Georgy S.; Olsson, Lennart (2006). "'Evolution on Rails' : Mechanisms and Levels of Orthogenesis" (PDF). Annals of the History and Philosophy of Biology (11): 99–138. ^ Gould, Stephen Jay (2002). The Structure of Evolutionary Theory. Harvard University Press. pp. 351–352. ISBN 978-0-674-00613-3. ^ a b Lane, David H. (1996). The Phenomenon of Teilhard: Prophet for a New Age. Mercer University Press. pp. 60–64. ISBN 978-0-86554-498-7. ^ Guyer, Michael F. (1922). "Orthogenesis and Serological Phenomena". The American Naturalist. 56 (643): 116–133. doi:10.1086/279852. JSTOR 2456504. ^ Schrepfer, Susan R. (1983). Fight to Save the Redwoods: A History of the Environmental Reform, 1917–1978. University of Wisconsin Press. pp. 81–82. ISBN 978-0-299-08854-5. ^ Ayala, Francisco J. (1988). Nitecki, M. (ed.). Can progress be defined as a biological concept?. Evolutionary Progress. University of Chicago Press. pp. 75–96. ISBN 978-0-226-58693-9. ^ Gould, Stephen Jay (1997). Full House: The Spread of Excellence from Plato to Darwin. Harmony. ISBN 978-0-609-80140-6. ^ Ruse 1996, p. 261. ^ a b Ruse 1996, pp. 21–23. ^ a b c Brown, Keven; Von Kitzing, Eberhard (2001). Evolution and Bahá'í Belief: ʻAbduʼl-Bahá's Response to Nineteenth-century Darwinism. Kalimat Press. p. 159. ISBN 978-1-890688-08-0. ^ Ruse 1996, p. 29. ^ Barbieri, Marcello (2013). Biosemiotics: Information, Codes and Signs in Living Systems. Nova Science Publishers. p. 7. ISBN 978-1-60021-612-1. ^ Jacobsen, Eric Paul (2005). From Cosmology to Ecology: The Monist World-view in Germany from 1770 to 1930. Peter Lang. p. 100. ISBN 978-0-8204-7231-7. ^ a b Vucinich, Alexander (1988). Darwin in Russian Thought. University of California Press. p. 137. ISBN 978-0-520-06283-2. ^ Mawer, Simon (2006). Gregor Mendel: planting the seeds of genetics. Harry N. Abrams. ISBN 978-0-8109-5748-0. ^ a b Watson, Marc; Angle, Barbara (2017). Man's Selection: Charles Darwin's Theory of Creation, Evolution, And Intelligent Design. BookBaby. pp. 146–150. ISBN 978-1-936883-14-1. ^ Ruse 1996, pp. 154–155, 162. ^ a b Wallace, David Rains (2005). Beasts of Eden: Walking Whales, Dawn Horses, And Other Enigmas of Mammal Evolution. University of California Press. p. 96. ISBN 978-0-520-24684-3. ^ Ruse 1996, pp. 266–267. ^ a b Shanahan, Timothy (2004). The Evolution of Darwinism: Selection, Adaptation, and Progress in Evolutionary Biology. Cambridge University Press. p. 121. ISBN 978-0-521-54198-5. ^ Sapp, Jan (2003). Genesis: The Evolution of Biology. Oxford University Press. pp. 69–70. ISBN 978-0-19-515619-5. ^ Gould, Stephen Jay (2002). The Structure of Evolutionary Theory. Harvard University Press. pp. 355–364. ISBN 978-0-674-00613-3. ^ a b c Simpson, George Gaylord (1964). Evolutionary Theology: The New Mysticism. This View of Life: The World of an Evolutionist. Harcourt, Brace & World. pp. 213–233. ^ Metcalf Maynard M (1913). "Adaptation Through Natural Selection and Orthogenesis". The American Naturalist. 47 (554): 65–71. doi:10.1086/279329. JSTOR 2455865. ^ John Merle Coulter. (1915). A Suggested Explanation of 'Orthogenesis' in Plants Science, Vol. 42, No. 1094. pp. 859–863. ^ Starr Jordan David (1920). "Orthogenesis among Fishes". Science. 52 (1331): 13–14. doi:10.1126/science.52.1331.13-a. JSTOR 1646251. PMID 17793787. ^ Lipman Charles B (1922). "Orthogenesis in Bacteria". The American Naturalist. 56 (643): 105–115. doi:10.1086/279851. JSTOR 2456503. ^ a b Kwa, Chunglin (2011). Styles of Knowing: A New History of Science from Ancient Times to the Present. University of Pittsburgh Press. p. 237. ISBN 978-0-8229-6151-2. ^ Dimichele William A (1995). "Basic Questions in Paleontology: Geologic Time, Organic Evolution, and Biological Systematics, by Otto H. Schindewolf" (PDF). Review of Palaeobotany and Palynology. 84 (3–4): 481–483. doi:10.1016/0034-6667(95)90007-1. ^ Jepsen, Glenn L. (1949). "Selection. Orthogenesis, and the Fossil Record". Proceedings of the American Philosophical Society. 93 (6): 479–500. PMID 15408469. ^ Jacobs, Susan C.; Larson, Allan; Cheverud, James M. (1995). "Phylogenetic Relationships and Orthogenetic Evolution of Coat Color Among Tamarins (Genus Saguinus)". Syst. Biol. 44 (4): 515–532. doi:10.1093/sysbio/44.4.515. ^ Ranganath, H. A.; Hägel, K. (1981). "Karyotypic orthoselection in Drosophila". Naturwissenschaften. 68 (10): 527–528. Bibcode:1981NW.....68..527R. doi:10.1007/bf00365385. ^ Stoltzfus, A. (2006). "Mutation-Biased Adaptation in a Protein NK Model". Mol Biol Evol. 23: 1852–1862. ^ Stoltzfus, A; Yampolsky, L. Y. (2009). "Climbing Mount Probable: Mutation as a Cause of Nonrandomness in Evolution". J Hered. 100 (5): 637–647. doi:10.1093/jhered/esp048. PMID 19625453. ^ Cigna, Arrigo A.; Durante, Marco, eds. (2007). Radiation Risk Estimates in Normal and Emergency Situations. Springer Science & Business Media. p. 213. ISBN 978-1-4020-4956-9. ^ a b c d e f g Popov, Igor (7 April 2005). "The Persistence of Heresy: The Concepts of Directed Evolution (Orthogenesis)". Retrieved 15 April 2017. ^ Barnes, M. Elizabeth (24 July 2014). "Edward Drinker Cope's Law of Acceleration of Growth". ^ Ruse 1996, p. 189. ^ Ruse 1996, pp. 181–191. ^ Ghiselin, Michael T. (September–October 1994). "Nonsense in schoolbooks: 'The Imaginary Lamarck'". The Textbook Letter. The Textbook League. Retrieved 2008-01-23. ^ Magner, Lois N. (2002). A History of the Life Sciences (Third ed.). Marcel Dekker, CRC Press. ISBN 978-0-203-91100-6. ^ Bowler 1989, pp. 116–117. ^ Luzzatto, Michele; Palestrini, Claudia; D'entrèves, Passerin Pietro (2000). "Hologenesis: The Last and Lost Theory of Evolutionary Change". Italian Journal of Zoology. 67: 129–138. doi:10.1080/11250000009356303. ^ Castle, W.E. (1920). "Review of Orthogenetic Evolution in Pigeons". The American Naturalist. 54 (631): 188–192. doi:10.1086/279751. ^ Gould, Stephen Jay (2002). The Structure of Evolutionary Theory. Harvard University Press. p. 283. ISBN 978-0-674-00613-3. ^ Ruse 1996, p. 395. ^ Bowler 1983, p. 157. ^ Lwoff, A. (1944). L'evolution physiologique. Etude des pertes de fonctions chez les microorganismes. Paris: Hermann. pp. 1–308. L'idée s'imposa que les microorganismes avaient subi des pertes de fonction. Celles-ci apparurent comme la manifestation d'une évolution physiologique, definie comme une degradation, une orthogenese regressive. ^ Loison, Laurent; Gayon, Jean; Burian, Richard M. (2017). "The Contributions – and Collapse – of Lamarckian Heredity in Pasteurian Molecular Biology: 1. Lysogeny, 1900–1960". Journal of the History of Biology. 50 (5): 5–52. doi:10.1007/s10739-015-9434-3. PMID 26732271. ^ Regal, Brian (2002). Henry Fairfield Osborn: Race, and the Search for the Origins of Man. Ashgate. pp. 184–192. ISBN 978-0-7546-0587-4. ^ The Course of Evolution by J. C. Willis. Review by: Carl L. Hubbs. The American Naturalist, Vol. 76, No. 762 (Jan. Feb., 1942), pp. 96–101. ^ a b c Koch, Leo Francis (1957). "Vitalistic-Mechanistic Controversy". The Scientific Monthly. 85 (5): 245–255. Bibcode:1957SciMo..85..245K. ^ Novack, George (2002). Marxist Writings on History & Philosophy. Resistance Books. p. 207. ISBN 978-1-876646-23-3. ^ Gray, Russell (1989). "Oppositions in panbiogeography: can the conflicts between selection, constraint, ecology, and history be resolved?". New Zealand Journal of Zoology. 16 (4): 787–806. doi:10.1080/03014223.1989.10422935. ^ Lima-de-Faria, A. (1988). Evolution Without Selection: Form and Function by Autoevolution. Elsevier. ISBN 978-0444809636. ^ a b Bowler 1989, pp. 261-262. ^ Mayr, Ernst (1982). The Growth of Biological Thought: Diversity, Evolution, and Inheritance. Harvard University Press. pp. 530–531. ISBN 978-0-674-36446-2. ^ a b Larson 2004, p. 127. ^ Gould, Stephen Jay (2002). The Structure of Evolutionary Theory. pp. Chapter 7, section "Synthesis as Restriction". ISBN 978-0-674-00613-3. ^ Levinton, Jeffrey S. (2001). Genetics, Paleontology, and Macroevolution. Cambridge University Press. pp. 14–16. ISBN 978-0-521-80317-5. ^ Montgomery, Georgina M.; Largent, Mark A. (2015). A Companion to the History of American Science. Wiley. p. 218. ISBN 978-1-4051-5625-7. With the integration of Mendelian genetics and population genetics into evolutionary theory in the 1930s a new generation of biologists applied mathematical techniques to investigate how changes in the frequency of genes in populations combined with natural selection could produce species change. This demonstrated that Darwinian natural selection was the primary mechanism for evolution and that other models of evolution, such as neo-Lamarckism and orthogenesis, were invalid. ^ see, for example, Müller, Gerd B.; Newman, Stuart A., eds. (2003). Origination of Organismal Form. Bradford. ISBN 978-0-262-13419-4. ^ Ruse, Michael (31 March 2010). "Edward O. Wilson on Sociobiology". The Chronicle of Higher Education. Retrieved 4 April 2017. ^ Ruse 1996, p. 536. ^ Ruse 1996, p. 530. ^ a b c d Tucker, Jennifer (28 October 2012). "What our most famous evolutionary cartoon gets wrong". The Boston Globe. Retrieved 29 December 2017. ^ Dawkins, Richard; Krebs, J. R. (1979). "Arms races between and within species". Proceedings of the Royal Society B. 205 (1161): 489–511. Bibcode:1979RSPSB.205..489D. doi:10.1098/rspb.1979.0081. PMID 42057. ^ Ruse 1996, p. 466. ^ a b c Ruse 1996, p. 468. ^ Dawkins 1986, p. 178. ^ Dawkins 1986, p. 181. ^ Ruse 1996, pp. 292–295. ^ Bowler 1989, p. 270. ^ Baxter, S.W. ; Papa, R.; Chamberlain, N.; Humphray, S.J. ; Joron, M.; Morrison, C.; ffrench-Constant, R.H.; McMillan, W.O. ; Jiggins, C.D. (2008). "Convergent Evolution in the Genetic Basis of Mullerian Mimicry in Heliconius Butterflies". Genetics. 180 (3): 1567–1577. doi:10.1534/genetics.107.082982. PMC 2581958. PMID 18791259. Bowler, Peter J. (1983). The Eclipse of Darwinism: anti-Darwinian evolutionary theories in the decades around 1900. Johns Hopkins University Press. ISBN 978-0-8018-4391-4. Bowler, Peter J. (1989). Evolution: The History of an Idea. University of California Press. ISBN 978-0-520-06385-3. Dawkins, Richard (1986). The Blind Watchmaker. Longman. ISBN 978-0-393-31570-7. Bateson, William (1909). "Heredity and variation in modern lights", in Darwin and Modern Science (A.C. Seward ed.) Cambridge University Press. Chapter V.
Dennett, Daniel (1995). Darwin's Dangerous Idea. Simon & Schuster. ISBN 978-0140167344. Huxley, Julian (1942). Evolution: The Modern Synthesis, London: George Allen and Unwin. Mayr, Ernst (2002). What Evolution Is. Weidenfeld and Nicolson. ISBN 9780297607410. Simpson, George G. (1957). Life Of The Past: Introduction to Paleontology. Yale University Press, p. 119. Wilkins, John (1997). "What is macroevolution?" 13 October 2004.